Do you ever wonder why you feel energetically different at different times? If you are a practicing yogi, meditate regularly or have come in to contact with energy healing techniques like Reiki, you may already have experienced some of the sensory awareness that arises when you learn how to sense and feel your ever-vibrating system of energy. In Chinese Medicine there are energy lines or pathways, that look like veins and travel throughout our body from the spine out to the tips of our fingers and toes. In Hinduism, Ayurveda and the yogic traditions we call these energy channels or ‘Nadis’ which branch outward from our central energy channel of the Susumna Nadi (pronounced ‘Sushumna’) which can be visualised as a bamboo pole, travelling the length of our spine, around our spine and our nervous system. Along this Susumna Nadi, are our Chakras. These spinning vortexes of energies are complex and beautiful wheels of light, each one, when open, allowing us to experience different positive emotional and physical qualities. The first, the root chakra, (Muladhara chakra in the ancient language of Sanskrit) is red and spirals downwards, connecting us to the earth. This is located in the space at the base of our pelvis, between our sit bones and out public bone, and when open enables us to feel connected to the earth, grounded and secure, that our survival needs are being met. The second, the sexual chakra, Swadhistana Chakra in Sanskrit, is orange and spirals from the front to the back of our womb space as women and the same space between the navel and the pubic bone in men. When this chakra is open, your creativity flows, you are emotionally healthy and able to connect with others emotionally. This chakra is connected to your sensuality and your ability to feel your way through life. The third, located in our solar plexus (the soft space between the bottom of our front ribs) is called the Manipura Chakra, yellow like the sunshine – this chakra is all about being able to radiate your light, your willpower, having clarity about your life path and purpose. For many people this is one of the two key places where your inner-compass lies. The fourth, beneath our sternum, is the Anahata, or heart chakra, and its colours are green and rose quartz pink. This is all about self-love, growth and healing. When this chakra is open you are able to give and receive in balance and to be able to live life from a place of trust, in a more relaxed way. The fifth, our throat chakra or Vishuddha chakra, is the colour blue and when open, allows you to speak your truth and communicate with ease. When blocked you may experience a sore throat and problems of the upper chest. The sixth, the third eye chakra, or Ajna Chakra, when open, enables consciousness, insight and intuitive awareness. The seventh, the crown chakra or Sahasrara Chakra, is the ‘one thousand petal lotus flower’, coloured white and violet. It connects us with the universe, to our infinite potential and to our highest purpose in life. So how can these chakras empower you in daily life? Well, everything is energy. At a sub-atomic level we are all made up of vibrating particles of energy. 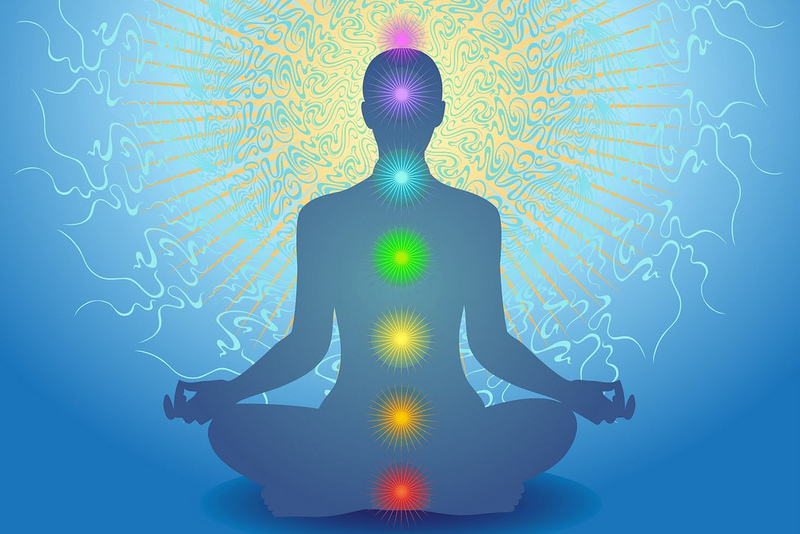 Hence, it is vital to have a regular practice like yoga or meditation, as a daily ritual, using breath (which carries energy – we call it ‘prana’ in yoga, vital life force energy), that can enable you, with opening movements and conscious stretching to open your energy channels, unblock and move your energy. When your chakras are open and your energy is flowing you can enjoy living life in flow too!